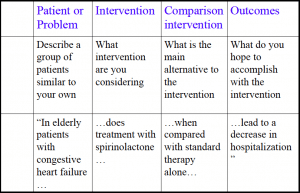 What makes a good clinical question? A Fellow’s view. Observation studies have shown that primary care physicians generate approximately 10 to 15 questions per day of practice (Covell, 1985; Ely, 1999; Ebell, 2003) but answers to two-thirds of these are not pursued at the point of care (Ely, 1999; Ely, 2000). If answered, half would have had a direct impact on patient care (Gorman, 1994). So clinical questions are common, important but often go unanswered. Why might this be? The medical literature is an ever growing jungle: Medline alone has some 24 million citations and there is a growing number of alternative databases too. It’s a wonder any of us cope, let alone a busy doctor or nurse! Angela is a patient on the general medical ward who recently moved to the area to be closer to her son and his family. She is 72 years old and has a history of congestive heart failure. She was admitted 2 days ago having presented with non specific chest pain, shortness of breath, an enlarged liver, swollen ankles and has been diagnosed with a non-ST elevation MI. She is extremely diligent about taking her medications (Lisinopril and aspirin). She also tells you she is a bit hard of hearing, has a slight cough, is a smoker of 20 cigarettes a day for 40 years. When you examine her: BP is 170/90 and her pulse is 80 and irregular. She is about to be discharged home on her previous medications plus 25 mg spironolactone od. She is happy to be going home and asks you if this new medication will help her stay out of hospital? Maybe some focused in on the potentially worsening heart failure? Others the risk of stroke from raised BP and possible atrial fibrillation? Or the potential issues around lung cancer? But the most important question here is the patient’s one: “Will this new medication (spironolactone) help me stay out of hospital?” Regardless of the other undoubtedly important questions, Angela’s is the one that needs answering first. Recognising this is the first step to making good clinical questions. So how to answer this question? And in a way that navigates the information jungle as timely and efficiently as possible? Whilst use of the internet as an information resource has increased dramatically in recent years, the sophistication and efficacy of searching and finding answers lags behind. Unsystematic ‘Google et al.‘ searches the likely modus operandi. 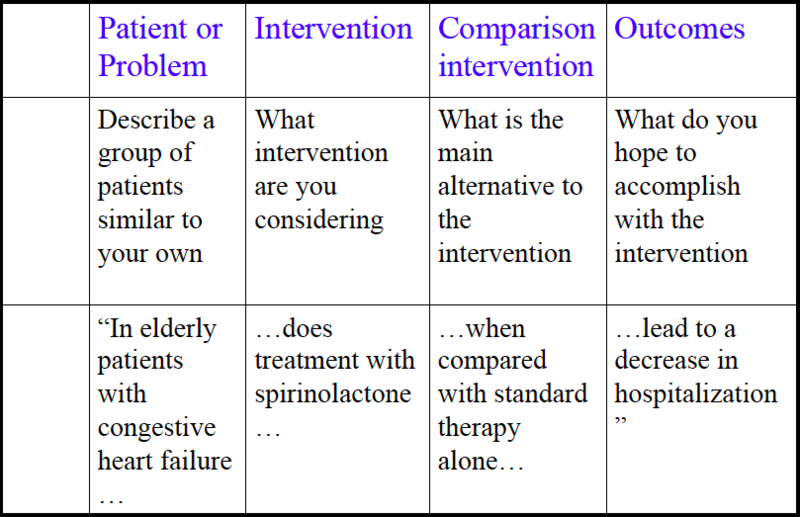 An un-focused question might look something like this: ‘Does spironolactone reduce hospitalisations?’ And the search for this in PubMed (as an example), might look something like this: spironolactone AND hospitalisation. This search returns 237 hits. Going back to one of the principles of Evidenced-based medicine which is to find the best available evidence, for our question the highest level of evidence is a systematic review of randomised controlled trials. If you know how, you can add filters to PubMed searches. If we add a ‘systematic reviews only’ filter we get 13 hits, two of which seem potentially appropriate for our question but require further in-depth reading. If we don’t know about filters, the same studies are is listed as the 30th and 96th hits on page 2 and 5 respectively of the PubMed return. This whole process took around 3 minutes, and that’s before I have checked to see if the paper applies to my patient (elderly, post MI heart failure) and my treatment (spironolactone). The PubMed search for this PICO looks like this: ((elderly) AND (congestive heart failure)) AND spironolactone AND hospitalisation. This search returns 129 hits, 7 with the systematic review filter, one of which appears suitable (the 2nd study identified in the first search above). Note that one of the studies in the first search is not included in the second, more focused search. It turns out the excluded paper did not give the age of the included patients at it excluded patients who had had an MI. Whilst the example given demonstrates a relatively small improvement in terms of time (less page scrolling/filtering) and efficiency (more relevant returns, for other questions the results can be much more dramatic (think ‘surgery’ AND ‘heart’).